Kase Lawal is a Nigerian-born businessman best known for his large oil company CAMAC headquartered in Houston, Texas as well as leading a diverse group of affiliate companies that comprise the second largest African-American owned company in the United States with more than 1,000 employees worldwide. Kase Lawal was born in Ibadan, Nigeria, in 1954. During his teenage years he became interested in the United States and especially the American civil rights movement. Lawal persuaded his father, who was an Ibadan politician, to send him to a university in the United States. Lawal first headed to Georgia and studied chemical engineering at Georgia Tech. He then later moved to Houston where he attended Texas Southern University. In 1976 he graduated from the university with a bachelor of science in chemistry. Lawal would later receive an honorary doctorate in humane letters from Texas Southern University and an honorary doctorate in philosophy from Fort Valley State University in Georgia. He earned a masters of business administration in finance and marketing from Prairie View A&M University of Texas. Lawal went on to work as a research chemist for a company that is now Haliburton and then as a chemical engineer for Shell Oil Refining Company. During this period he met his wife Eileen and they had three children. Lawal established CAMAC (stands for Cameroon-American) in 1986 and it operated as a company trading agricultural commodities such as rice, sugar, and tobacco. After the Nigerian government started to develop its energy market in the early 1990s Lawal made a jump with CAMAC to the energy sector. In 1991 CAMAC made a deal with oil giant Conoco and agreed to jointly operate and share production from any Nigerian discoveries. A combination of his political contacts, local market knowledge, and the backing of a major oil firm made Lawal’s company a major competitor in the oil industry. CAMAC has since expanded and now has offices in London (UK), Johannesburg (South Africa), Lagos and Port Harcourt, Nigeria and is linked to the exploration, refining, and trading of oil. Lawal served as the CEO until April 11th, 2011 and currently has the role of chairman of the board with the company. Lawal is also the founder of Erin Energy Corporation and has been its CEO since April 12th, 2011 and was its director and chairman since April 2010. He serves as the chairman of Allied Energy and is on the Houston Mayoral Advisory Board. He is a member of the board of directors of Unity National Bank, the only federally insured and licensed African-American owned bank in Texas, and Cape Investment Holdings. Lawal was appointed in February 1999 as a member of the United States Trade Advisory Committee on Africa which was advisory group to the U.S. president and U.S. trade representative on trade policy on Africa. 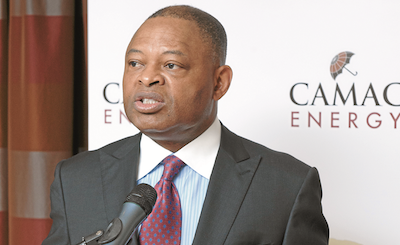 Lawal received the US-Africa Business Person of the Year in 1997 award and in 2002 CAMAC was named the largest African-American owned company on the Black Enterprise 100s list. Bloomberg Business, "Kase Lukman Lawal." Company Overview of Erin Energy Corporation. Bloomberg Business, http://www.bloomberg.com/research/stocks/private/person.asp?personId=5981161&privcapId=62604221; CAMAC. "CAMAC Leadership." Leadership – CAMAC. CAMAC, http://www.camac.com/leadership/; Palk, Susannah, "Kase Lawal: Not Your Average Oil Baron." CNN. Cable News Network, http://www.cnn.com/2010/WORLD/africa/05/18/kase.lukman.lawal/index.html.